This Kettle boils approximately 3.5 Mugs of water at a time and is ideal for Car Camping, Scouts, Picnics, Hunters, Caravaning camping gear, Wilderness Survival Kit, 4 x 4 off-roaders, Disaster & Emergency Kits, Humanitarian Aid, kayakers or anyone working in the outdoors. 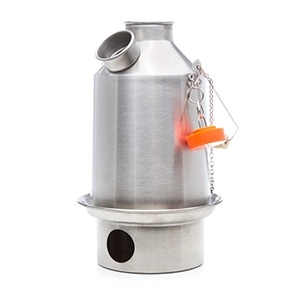 The Kelly Kettle is a superb piece of camping equipment that even works in storm conditions bringing water to the boil within a matter of minutes using whatever solid fuel is naturally occuring in the area - sticks, grass, pine cones, birch bark etc. No need to carry fuel. No running costs. Users have described these kettles as the 'Greatest invention of all time'. Cost-free, carbon-neutral, eco friendly camping at its very best! Add our Pot-Support & Cook set to cook small amounts of food (Noodles, Rice, Oatmeal, Re-hydrated food, Soup, etc.) over the kettle while your water boils.